Lanyards offer an easy way to improve security in your work place or at your event. Attach ID cards or keys using the metal swivel hook. 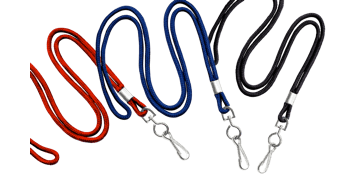 Our cord lanyards are available in 4 different colours with a hook attachment. Ideal for events, tradeshows, conventions, sales meetings, offices and more.